Silver Star Apartments is the first Zero Net Energy (ZNE) multi­family, affordable housing project in Los Angeles, for former homeless veterans. It is that time of year when I reflect on what has transpired in the residential built environment relative to policy, culture, and technology. Policy Wins: A big win in 2017 was the City of Los Angeles’ Accessory Dwelling Unit (ADU) Ordinance. ADUs are units attached or detached to a primary residence that are permitted to be used as dwelling places. Many ADUs are garage or recreation room conversions, and many until now were unpermitted. ADUs have been identified as an important lever for providing housing at a reasonable cost and supplementing the low stock of housing that is available. ADUs often house family members, the elderly, home care providers and the disabled, offering an affordable option for moving into an existing neighborhood. They are now legal to be permitted in the City of LA. Tiny houses and shipping container homes, some of which can be considered ADUs, continue to be an American fascination. This year and next promise to bring forth new, modern designs reusing materials, emphasizing smaller footprints and also alleviating the housing shortage. Young people seem particularly keen on shipping container housing as an affordable means to live sustainably. Neighborhoods of tiny homes, such as one found in Portland, are springing up to support those houseless (as they refer to the homeless population in Portlandia). Another big win was the defeat of Measure S, also known as the measure that would have banned all new construction requiring a zoning exception. Do we need to redo every Community Plan? Yes. Should we halt the construction of much needed housing? No. Also happy news was the passing of Measure JJJ, spurring the development of affordable housing near transit and emphasizing local labor hiring practices. November 2018, get ready for a ballot measure allowing $4 Billion in bonds to support housing programs and veteran’s home loans. The Federal budget is another conversation, as there does seem to be an indication that support for affordable housing projects would be cut drastically. Stay tuned on that one. Culture Wins: The announcement that Los Angeles will host the 2028 Olympics has spurred a home buying frenzy in South Los Angeles. Buyers who entered the market in 2017 have already realized significant appreciation. Areas such as Leimert Park, Inglewood and neighborhoods stretching along the Crenshaw Line, are being invested in by first-time buyers (and flippers). New businesses and economic growth are finally being infused in the area which traditionally has been very disinvested. The drought was declared over (yay, but we’ll see how next year goes) and Angelenos reduced their water use by 20 percent. 100,000 homeowners participated in utility rebate programs, including turf removal and appliance and system upgrades. It seems our culture is beginning to celebrate a universal value of sustainability when it comes to our homes. We heard so much this year about resilience in relation to communities impacted by natural disasters. There were the hurricanes, the wildfires, the floods and the earthquakes that rocked the global community. Rebounding and rebuilding will be a major task for the next decade. Technology Wins: Google Home and Amazon’s Alexa connected our homes to all of our other devices and to us. Having Sonos, Nest, FireStick, Honeywell and all other IoT connected devices controlled by one hub that we can speak to feels like we’re moving into the future rapidly and in a more controlled fashion. Amazon’s search for the location of their second headquarters has been entertaining to follow. Many Mayors of cities courting them created commercials where they posed the question of, “Alexa, where should Amazon’s new headquarters be”. She dutifully answered with the city of the Mayor represented in each one. Rather clever, rather cheeky. In 2018, we’ll find out where this hub will land. Augmented reality is penetrating the residential construction market. The first market-ready helmets, goggles and accessories are being used to provide thermal imaging, to project BIM models atop actual structures and training new tradespeople in a more experiential way. It can also show the viewer what they can expect to see from the top of their new building projected over google maps. This technology is different and much more useful than artificial reality. Lastly, the conversation regarding fuel sources has landed on the opinion that the best way to ensure a sustainable future for Earth is… the electrification of everything. Powered by renewable sources, we have seen a movement of electric vehicles, electric busses, and an overall shift away from combustible sources of energy. This is due to concerns about safety, air quality and the overall health of people and other living things. 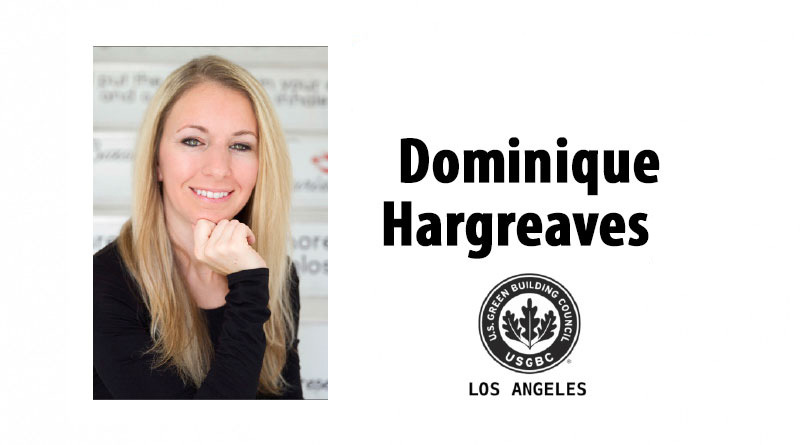 Dominique Hargreaves is the Executive Director of the U.S. Green Building Council-Los Angeles Chapter. She also serves as the LA Metro Sustainability Council’s 1st Vice Chair and Chair of the Council’s subcommittee Metro27, and on the UCLA Advanced Energy Communities Technical Advisory Committee. She may be reached at www.usgbc-la.org.